PMGZ Feet - All About Health, Inc. When you address only part of the body, you will receive only partial healing; but when you Harmonize the body as a WHOLE, you will receive WHOLE body healing ~ physically, emotionally, mentally and spiritually. 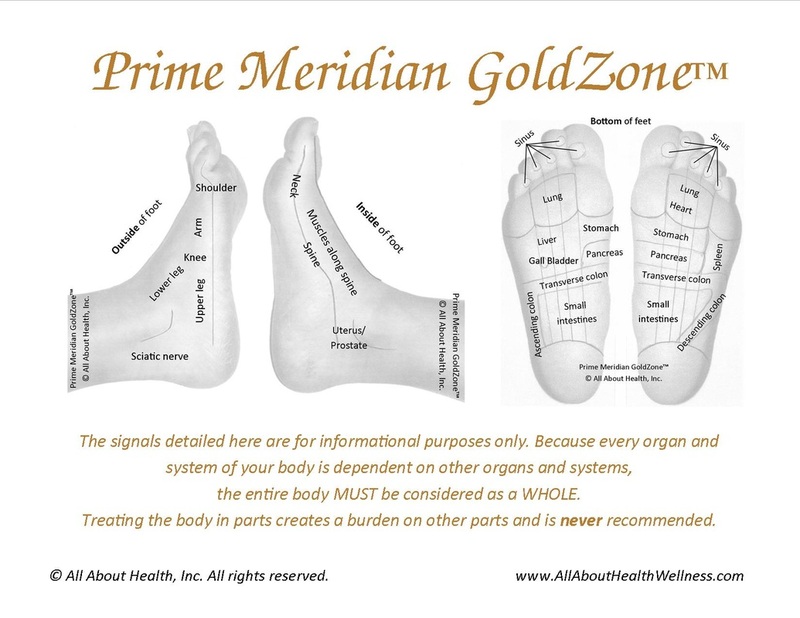 The Prime Meridian GoldZone™ (via the feet) IS whole body healing. The signal system in the feet connects to every cell in the body. The signal system is an invisible energy representation of the whole body (physical, emotional, mental, and spiritual). The right foot represents the right side of the body and the left foot represents the left side of the body. Both feet put together represent the whole body. Everything negative that you experience in your life creates disturbances in YOU. This includes the thoughts you have, the emotions you feel, the food you eat, the things you drink, the air you breathe, etc. All disturbances are reflected in your feet and can be Harmonized through your feet. A simplistic way of understanding this is imagine that your body is the computer and your feet are the keyboard; we "program'"your body through your feet. 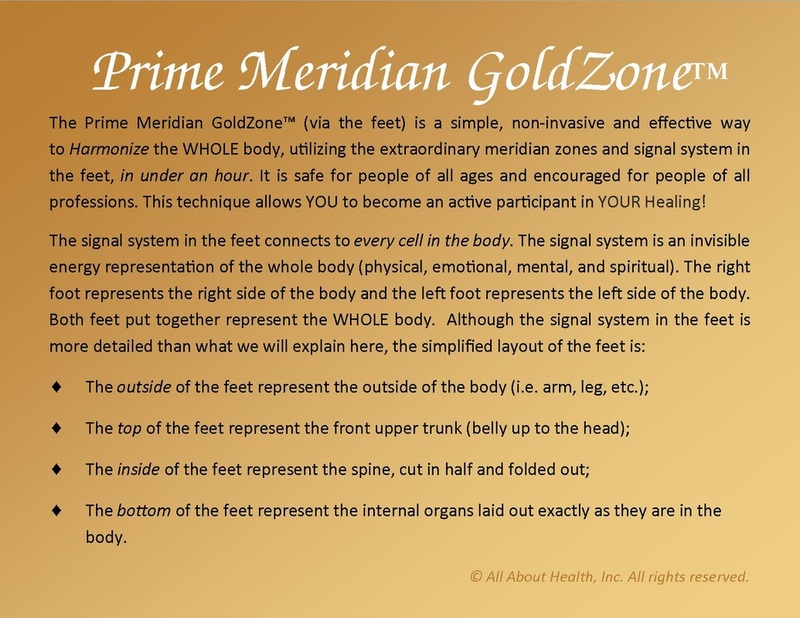 The Prime Meridian GoldZone™ (via the feet) is a simple, non-invasive and effective way to Harmonize the WHOLE body, utilizing the extraordinary meridian zones and signal system in the feet, in about an hour. It is safe for people of all ages and encouraged for people of all professions. This technique is an important step for you to become an active participant in YOUR healing! Prime Meridian GoldZone™ common signals diagram. and it’s about Experiencing the power of YOU! You will come in, take off your shoes and socks, sit back and relax. ​You will be given a glass of Kangen water to drink throughout your session. NOTE: It is important to drink water during and after a Prime Meridian GoldZone™ (via the feet) session for best results. We will begin with your right foot, GoldZoning the outside, top, inside and bottom before moving to your left foot. The session takes approximately 45 minutes to an hour. Feel free to ask any questions during your session. You can talk as much or as little as you'd like. For best results, do NOT apply lotion or oil on your feet before your session.